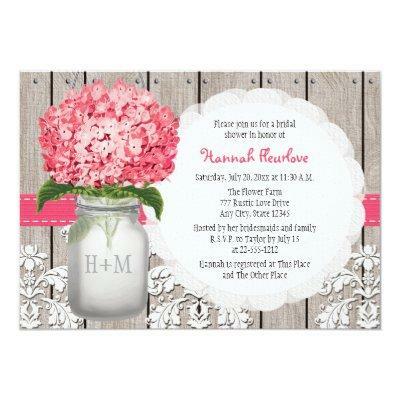 Pretty and trendy rustic style monogrammed mason jar bridal shower invitations with a bright pink hydrangea flower and a wooden fence and antique damask pattern lace background and stitched hot pink and fuchsia ribbon. These invites can be personalized with the initials and monogram of the bride and groom on the mason jar. These invites are perfect for a country, farmhouse, garden party or barnyard style wedding, couples or bridal shower. Designed by Chrissy H. Studios, LLC.